I grew up in a farming family where money was always tight and if things were broken you learned how to fix them because you couldn’t afford to get someone else to do it. I would watch with awe and learned as my father, his brother and my paternal grandfather rolled their sleeves up and fixed their machinery. I learned three important sayings -‘if it is made by a man it can be fixed by a man’ ‘if a machine can do it a man shouldn’t be doing it’ and ‘if you want to learn how to do a job easily give it to a lazy man to do’. These three have stayed with me. As a child we used to visit my maternal grandparents in York. I had a fascination with taking apart their torch and playing with the battery and bulb. This was further stimulated when I received for Christmas an experimentation kit called Magnetricity that had lots of electrical projects.The seed was therefore sown at an early age. One wet Sunday afternoon, also at my grandparents, I was bored and giving my sister grief. My father slightly lost it and after a moments thought told me to get in the car. Off we went to the far side of York to visit the house and family he knew. The owner of the house was a radio amateur (I think his call was G2BLS). He took us into his radio ‘shack’ and a new world exploded in front of me. Centre stage was a R1155A wartime receiver with knobs and dials that transfixed me. My father persuaded the owner to sell it to me providing I could raise the funds myself (£3.50 in old money). Each year at school we had the October half term holiday. In our area of Yorkshire this was known as Potato Picking Week. The local farmers still picked potatoes by hand and the local housewives would pick these by breaking their backs filling wire baskets of potatoes. For this one week we as kids also joined in the picking frenzy and we all competed to get work at the highest paying farm. You never knew how much you would get and you dreamed as you laboured how much your pot of gold might be at the end of the week. For this reason you worked as hard as you could and kept your head down. That year I got my potato picking reward of £3.50 and the receiver was mine. I became a short wave listener and the whole world was on my doorstep through my headphones and loudspeaker. I started taking Short Wave Magazine and joined the HPX Ladder for collecting amateur radio callsign country prefixes. While listening one night I head a very strong station who was local to me at Alne. His call was G3BNM and his name was Alf Whitelock. He was talking to his nephew John (G3WQM) and the local doctor in Tollerton called Ted (G3TMN). I made contact with Alf who was a former signalman on the railway and he took me under his wing. He cleaned up the R1155 and got me building a converter for TopBand (160m) and 10m and 15m. We also built a pre-selector. My listening took on a new dimension and antennas began to be strung from the rear of our house to various trees. 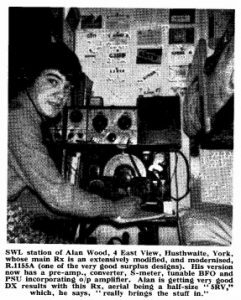 This is my set up in November 1968 as shown in SWM. (If any reader has the original magazine I would appreciate buying it). Alf and John introduced me to another local in Tollerton (G3VXG) who was taking his son to York Tech College once a week to study for the Radio Amateurs Exam. I joined them and in 1969 I passed my RAE but did not have the Morse test required for a full licence. I joined the Fulford Amateur Radio Club and met a wider group of enthusiasts. They introduced me to contest operation with events taking place from Garraby Hill near York. Alf sadly died before I left school. I passed through Cubs and Scouts and learned much about leadership which also stayed with me through later life. I left home after 6th Form and moved to near Newbury to take up training to become an Applied Physicist. Here I met Dave G8FNS who was an apprentice where I worked. There were others in the apprentice school also licensed with many G8xxx Class B callsigns (including G8GHA, G8FGF). Dave persuaded me to join them and get on the air and I applied for a licence and became G8GGH. (Glory Glory Hallelujah). My early equipment was ex Pye Telecoms mobile radios such as the Ranger, Vanguard and Cambridge and later a F27 base station. I joined the Newbury Amateur Radio Society and contest work once again became a key interest, this time from Walbury Hill near Newbury. At work meanwhile I met an ex Navy wireless operator and he gave me Morse lessons during the lunch break. I soon passed the 12 words per minute Morse test and migrated to a full licence – G4EEE. The circle of contacts in and out of work expanded and I met John (G8MGC) and Mike (G8DCA). John worked in the drawing office and Mike was a design engineer. Mike began to design small radio modules we could use in our hobby as at that time Phase 2 UHF repeaters were just coming on stream in the UK and there was no equipment for them. We began to sell kits of single channel crystal controlled 500mW transmitter and receiver modules to other amateurs in the area and then word spread. Before long we had a healthy demand for our products across the UK and worldwide. The demand soon became so large that I decided to quit my full time job. From 1st January 1982 I started full time in the business. Growth was rapid not just to other amateurs but also to an increasingly large commercial sector that saw our products as a way of solving communication problems in their products. The business grew and became well established. I finally sold it in 2013 and am now retired. When I sold it had reached a healthy £8m annual sales and supported 70 staff over four UK sites. The sales were all radio communication related and to commercial and military clients. Over 50% was to export clients for which we received the Queens Award for Enterprise. We could take a clients requirement, design it to their needs, manufacture it on site and support it in service. We had product down linking from drones, connecting diamond mining vessels from ship to shore, telemetry links on military training systems, providing radio backbone infrastructure for utility companies – our product was everywhere and we were well know and highly respected for our quality of product and service. We never hesitated to invest in technology if it moved us forward. We used 3D CAD to design our enclosures and had a CNC machine shop to mill our housings. We used PCB layout software that integrated directly into our surface mount manufacturing line with its 20,000 parts per hour capacity. Our aim was always to be in control of our own destiny by undertaking as many as possible of our processes in house. It was a great place to work with a great team of dedicated people. John retired from the business in the early days to pursue a career elsewhere and is now retired and living in France. John like me is still designing and making things using Fusion 360, 3D printing and Arduino modules. Mike retired in 2000. I promoted my key departmental managers to Directors and gave them equity and we took the company forward to sale in 2013. This was 36 years after things started with John, Mike and myself and more than 50 years since that afternoon at my grandparents in York when I was giving my sister grief. The business was bought by a listed company who had no idea what they had bought or how to use it to advantage. They closed it down after 3 years and made everyone redundant. The business story doesn’t quite end there however because various members of my old team have done a phoenix regeneration and I wish them every success. I am glad the baton has been passed and it feels good. For my part I now spend most of my waking hours in my home workshop ‘doing stuff’ as these blog pages detail. I have a natural curiosity for all things technical no matter what the discipline. I also love France and the rural French people who have made us so welcome. I often think (and so does my very understanding wife …) that I am trying to make up for all the hours I ‘lost’ in my working life. But if I hadn’t made the business what it became, it wouldn’t have been attractive to a buyer. Without this investment in my time I wouldn’t be in the very privileged situation I now find myself in. Why does life always seem back to front ? I hope you enjoy reading the continuing Woody story.